There’s a lot more to keeping lawn green than just a mow and blow. Lime, fertilizer, aeration, and overseeding are critical components to success. Lawn repair is fairly straightforward. If children, pets, or harsh temperature extremes have damaged portions of your lawn, it’s a simple matter to use new sod, or sprinkle seed to repair it. If you have a sod lawn, make sure you get the same variety of grass and just cut the sod with a knife so it fits seamlessly within the damaged spot. If you have a seed blend, just sprinkle seeds and about an eighth of an inch of compost over the top. You’ll need to keep these sections moist until they are established, about two weeks for sod and eight weeks for seed. Dog waste is one of the most common causes of bare patches in the lawn, because urine is so acidic that it creates inhospitable growing conditions for the lawn. Whenever possible, flush the lawn with water right away whenever you notice urine or waste to prevent damage. Once you have a bare spot, repair by flushing the area with water, then adding a small amount of horticultural lime to correct the pH as well as a small amount of compost and grass seed to fill in the bare patch. While many people think of lawn care as being a simple matter of mowing and blowing, in reality there’s a lot more involved in keeping your lawn healthy and beautiful over the long term. Here, get an overview of the best practices to follow when maintaining your lawn. What’s involved in lawn care?Mowing. It’s best to mow high, mow often, and leave the clippings on your lawn to break down and feed the beneficial microbes in the soil. Each time you mow, remove no more than one third of the height of the grass, aim to keep the lawn 3 to 4 inches high, and mow often enough that if you leave the clippings on your lawn, they don’t clump up and create an unsightly mess. You’ll need to bring out the string trimmer to cut the grass in areas where your mower can’t reach, such as around tree rings, uneven masonry edges, or boulders in the lawn. Even if you have an automatic sprinkler system, you should not take a hands-off approach to watering. Check the moisture level of your lawn periodically to make sure it is neither soggy nor dry, since changes in weather have an obvious impact on how much water is needed. Brian Beane of Nature’s Select in Winston Salem, NC recommends seven different treatments per year with varying ratios of nutrients to keep your lawn at its best. Not only does lawn fertilization keep your grass looking green, it also promotes a thick, healthy lawn which is better able to out compete weeds. Turfgrass prefers a pH of about 6.5 to 7 in order to utilize the nutrients existing in the soil. If you have a lot of moss in the soil, that’s an indication that your soil is too acidic for turf. Lawn care companies apply lime at least once a year to keep the soil pH in the right range. Aeration, or coring, removes little plugs of soil from the lawn in order to relieve compaction and break down thatch. After using an aeration machine, your lawn care professional may rake compost over the lawn, apply fall fertilizer, or sprinkle lawn seed to refresh any areas that have become a little thin. Thatch is a buildup of dead leaves and stems along the soil surface which can keep water from penetrating fully and provide a haven for insects and disease to flourish. While yearly aeration is usually enough to keep thatch problems at bay, in some circumstances you may need to use a dethatching machine which has vertical blades and can cut out and loosen the thatch layer. In fall, most lawn care services apply grass seed over the entirety of the lawn, even if the lawn looks healthy. Many types of turfgrass have a short lifespan of only a few years, so regular overseeding prevents the lawn from becoming thin and overrun with weeds. Compost is one of the unsung heroes of the lawn, because it helps retain moisture, encourages earthworms which aerate the soil naturally, and provides a slow trickle of nutrients. You can apply compost any time, but many lawn care professionals apply compost at the same time as aeration and overseeding. Spring is the time to prevent weeds by using a pre-emergent weed control product which creates a film over the surface of the soil and makes it hard for weed seeds to sprout. There are conventional pre-emergents as well as natural ones made of corn gluten. Once the weeds have sprung up, there are two options: pull the weeds by hand using a soil knife or a long-handled tool such as Grandpa’s Weeder, or use selective herbicides which can be applied over the entire lawn but will only kill broadleaf weeds. The best way of preventing both weeds and pests is through cultivating a healthy, thick stand of turfgrass. If you do end up with disease or insect problems, there are many products on the market to help. Be sure to read all instructions carefully to minimize harm to birds and wildlife, pesticide runoff to natural waterways, and to keep your family and pets safe. 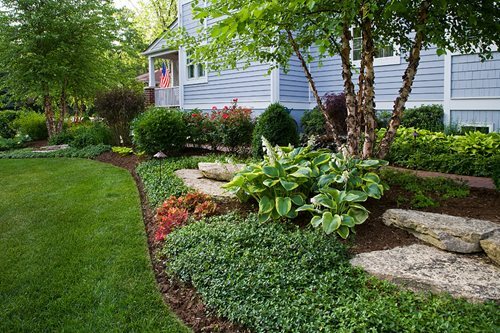 Get recommendations on how to maintain planting beds in your landscape from Grant & Power, an award winning landscape company. WinterizationIn cold climates where it snows, you’ll need to prepare your sprinkler system for winter by doing what’s called a blowout of the system. Many lawn care professionals offer this service, which consists of using an air compressor to blow all of the water in your irrigation pipes out of the system so when the ground freezes, your irrigation pipes will not burst. The other thing you’ll need to do to prepare your lawn for winter is to use a winterizer fertilizer. The winterizer fertilizer encourages the lawn to set down deeper roots and gives it the nutrients it needs to withstand harsh weather. It’s important that your winterizer fertilizer uses ammonium nitrate as the nitrogen source rather than urea. “Urea requires the microbes in the soil to break it down, and in colder times the microbes are much less active,” says Beane. There are two different types of lawn care company. We are all familiar with lawn care services which provide a simple mow and blow. However, there are also “chemical” lawn care companies who keep track of the complex series of pest control, disease control, and fertilization requirements needed to keep your lawn performing at its best. While the word “chemical” may make you think of pesticides, many of these companies utilize a blend of natural and conventional approaches to get the best results in a more eco-friendly manner. If reducing chemicals is important to you, be sure to speak with your lawn care company about healthier alternatives to traditional herbicides and pesticides. Pro Tip: “Project Evergreen’s GreenCare for Troops is a program that provides free lawn care for our troops,” says Beane. If you have a loved one currently deployed in the armed forces, you may be eligible for free lawn care and landscaping services from companies who sign up to volunteer as a way of saying “thanks” to our active military. “It’s a great program,” says Beane. Cost of lawn care servicesHiring a pro for lawn care doesn’t need to break the bank. A simple mow and blow can cost as little as $25-$40 per trip for small suburban yards. If you have a number of obstructions or design elements that need to be individually string trimmed, such as having a lot of tree rings within the lawn, that can raise the price. In addition, if your lawn care crew can’t get their regular mower into your backyard and has to use a smaller push mower, that will also have an impact on the price. Chemical lawn care services, such as fertilizing and pest control, usually cost about $60-$80 per application, and you usually need about seven applications per year. Natural options such as organic fertilizer can be on the higher end of that range, while conventional synthetics cost less. Of course, the square footage of your property will be the biggest factor in determining price.